Decora Geraniums are the most popular trailing variety across UK & Europe. Producing cascades of vibrant colour over sides of pots, baskets, window boxes and containers. Easy to grow and drought tolerant - ideal for planting in a sunny location. Long lasting displays flowering up to the first frosts in Autumn. Supplied as 24 jumbo plug plants - 12 red, 6 pink & 6 lilac bicolour. 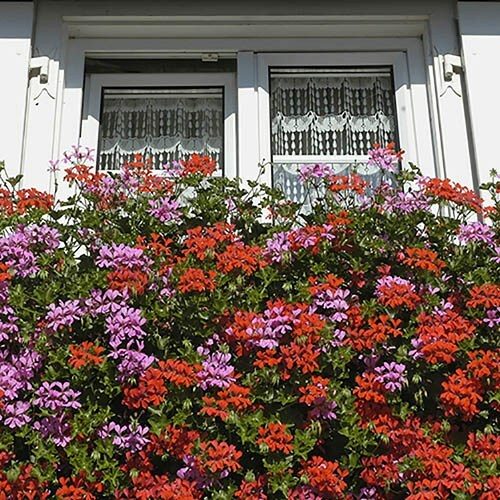 Best known for their ability to cascade with free flowering displays from window boxes and hanging baskets, Decora Trailing Geraniums are the most popular type across the UK and Europe. They have incredible Flower-Power and will produce a non-stop torrent of colourful blooms from May until the frosts in the autumn, rewarding you with an even better show if you occasionally feed with a high potash plant food. Decora Geraniums will thrive in a hot, sun-drenched location and therefore make the perfect plant for the discerning but busy gardener! Our collection comprises 24 strong Jumbo-plug Plants that will arrive nursery fresh and ready to grow like crazy. Supplied as a pack of 24 jumbo plug plants (2.5 - 3.5cm diameter): 12 x 'Decora Red' 6 x 'Decora Pink' 6 x 'Decora Lilac' Bicolour Plant outdoors after the last frost usually anytime from mid-May onwards. Remove faded flowers regularly to prolong blooming. Plant approx. 20cm (8in) apart to allow them room to grow. Feed using a high-potash feed such as Blooming Fast Superior Soluble Fertiliser for Flowers & Fruits, to encourage flowering.